Not realising that it doesn’t get light in Darwin at this time of year until 7 o’clock, Rick’s suggested meeting time, I moved it forward to 6am to try and get his FAB Dock installed before the heat and humidity set in, so that we could be admiring our handywork with a beer in hand before lunch. So it was just as well that Drew and Saul came prepared with torches. The install went perfectly well on the marina beach and we were soon towing Rick’s new FAB Dock into place. 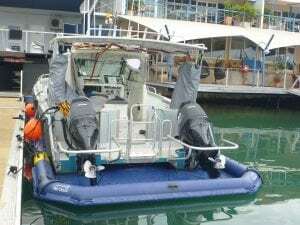 A short time later and we had one of Rick’s seven commercial dive boats safe and dry inside it’s new home. So if you are ever up that way and need something fixed, removed or salvaged from the ocean, Rick and his team are the guys to call. One of the most professional, hard working and friendly crews that I have ever had the pleasure of working with. And once the locals see the benefits and savings Rick gains from his FAB Dock, I am sure we will be seeing a lot more of each other in the coming months.